Can being ambitious derail your career? It can when it leads to a multitude of bad habits. 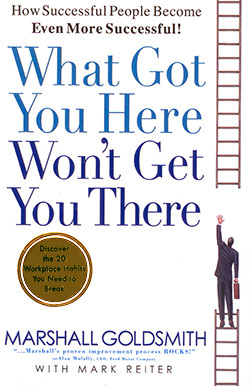 We continue our Leadership Hall of Fame series, a year-long look at the top business books and authors, with an excerpt from What Got You Here, Won’t Get You There (2007) by Marshall Goldsmith, with Mark Reiter. By itself, goal obsession is not a flaw. Unlike adding value or punishing the messenger or any of the other twenty annoying habits, goal obsession is not transactional; it’s not something you do to another person. But it is often the root cause of the annoying behavior. Goal obsession turns us into someone we shouldn’t be. Goal obsession is one of those paradoxical traits we accept as a driver of our success. It’s the force that motivates us to finish the job in the face of any obstacle–and finish it perfectly. A valuable attribute much of the time. It’s hard to criticize people for wanting to do things 100 percent right (especially when you consider the sloppy alternative). But taken too far, it can become a blatant cause of failure. In its broadest form, goal obsession is the force at play when we get so wrapped up in achieving our goal that we do it at the expense of a larger mission. It comes from misunderstanding what we want in our lives. We think we’d be truly happy (or at least happier) if only we made more money, or lost thirty pounds, or got the corner office. So, we pursue those goals relentlessly. What we don’t appreciate until much later is that in obsessing about making money, we might be neglecting the loved ones–i.e., our family–for whom we are presumably securing that money; in obsessing about our weight with extreme diet we might actually end up doing more harm than good to our bodies; in pursuing the corner office we might trample upon the colleagues at work whose support and loyalty we will need later on to stay in that corner office or move even higher. We start out with a road map heading in one direction but end up in the wrong town. It also comes from misunderstanding what others want us to do. The boss says we have to show ten percent revenue growth for the year, so when it appears we will miss that target, goal obsession forces us to adopt questionable, less than honest methods of hitting the target. In other words, the honorable pursuit of a difficult goal set by someone else transforms us into cheaters. If you examine it more closely, we’re not really obsessed with hitting the ten percent growth; our true goal is pleasing our boss. The only problem is that we either don’t see this or we refuse to admit it to ourselves. Is it any wonder our values get mixed up? Goal obsession has warped our sense of what is right or wrong. As a result, in our dogged pursuit of our goals we forget our manners. We’re nice to people if they can help us hit our goal. We push them out of the way if they’re not useful to us. Without meaning to, we can become self-absorbed schemers. Consider a marketing executive named Candace with whom I worked. By all accounts, Candace was the poster child for “having it all.” She was 38 years old, with a happy marriage and two healthy perky children at home. She was so energetic and capable that the company gave her two personal assistants. Her staff admired her for her creativity and poise–and for the breakthrough results she produced. She delivered the numbers–and then some. Her office was littered with “Marketing Executive of the Year” plaques and tributes from the industry trade magazines. Her CEO considered her his eventual successor. So, what’s wrong with this picture? Candace had a problem retaining her talented staff. A lot of them asked to be transferred to other parts of the company or simply left. My job was to figure out why people didn’t want to stick around working for such an obvious star. When I dig a little deeper, the universal complaint about Candace was that she always had to be front and center in every success. She hogged the spotlight. It wasn’t that Candace withheld praise or recognition. If one of her staff came up with a great marketing campaign, Candace would shower him or her with praise. But she would always take center stage when she reported the success to her superiors. That was her flaw. Goal obsession had turned Candace into someone who claimed credit for everything, even when she didn’t reserve it. If I could make her see that her goal of being a star–as opposed to being an effective leader–was misguided, then everything else would fall into place. She wouldn’t be so desperate to purloin credit from her peers and staff. She could learn to accept that their triumphs said something positive about her as a leader. As I say, this is why I’ve given goal obsession its own special corner. It’s not a flaw. It’s a creator of flaws. It’s the force that distorts our otherwise exemplary talents and good intentions, turning them into something we no longer admire. Read more from Marshall Goldsmith and our Leadership Hall of Fame. Excerpted from the book What Got You Here, Won’t Get You There by Marshall Goldsmith with Mark Reiter. Copyright (c) 2007 Marshall Goldsmith. Published by Hyperion. All Rights Reserved.